Here are a few of BBC Good Food Middle East’s favourite shorthaul destinations for relaxation and gourmet bliss. Till the end of 2017, get 25% off best available rate including breakfast – valid for all rooms types. Prices from USD $950 per room, per night (before discount and including tax). Conrad Maldives Rangali Island exudes romantic bliss. The resort offers unique ways to kindle romance amongst the picturesque surroundings of aquamarine waters, sugary soft beaches accented with palm trees and lush greenery. Once there, treat your loved one to the ‘Dream Island Experience’, which whisks you both away by speedboat to your own private tropical island. The Conrad Maldives crew will prepare a castaway style oasis on the beach and then anchor in the lagoon so that you can snorkel. Your gourmet castaway picnic will include a selection of cold meats, grilled vegetables, fresh salads and sandwiches, assorted sushi and sashimi and tropical fruits and hand crafted desserts. Once back at the resort, Conrad Maldives is a true gourmet’s delight with a choice of 12 restaurants and bars featuring unique and individual menus, celebrity chef restaurant Ufaa by Jereme Leung as the 12th dining outlet. The resort understands that a remote location needn’t prohibit fine dining and good wines. 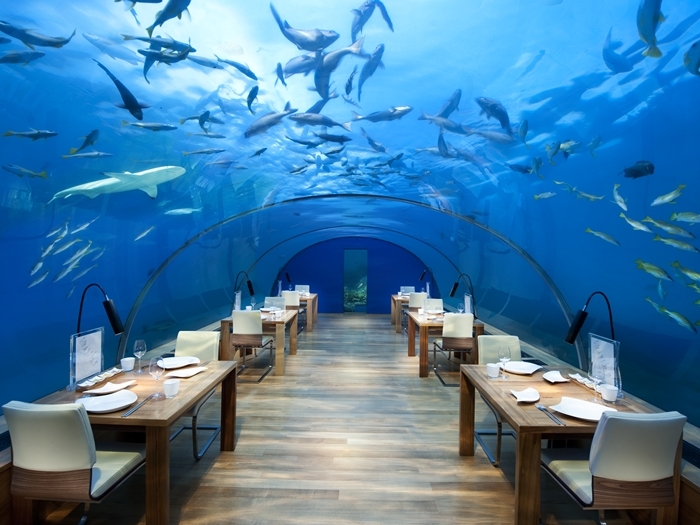 It was the first resort to build an underground wine cellar in the Maldives; the first to create an undersea restaurant; the first to invite world-class chefs and winemakers to its islands and the first to establish a cheese bar. Details: Get in touch: Call +960 668-0629 or e-mail mlehi.maldives@conradhotels.com. Anantara Hoi An Resort is inviting all couples to feel the love with their Romantic Getaway Package. The package includes three nights’ accommodation or more in a room or suite, daily breakfast for two, one Dining by Design experience for two, and one 60-minute Aromatic Bliss Massage for two. Airport transfers are also included. Couples looking for exceptional relaxation can enjoy a range of nourishing scrubs and wraps, heavenly massages and rejuvenating facials. Drawing on the centuries-old Vietnamese wellness techniques, signature Anantara Hoi An spa treatments incorporate natural ingredients such as local herbs, coconut milk, black sesame, coffee, aloe and local mineral mud for an experience firmly rooted in regional traditions. The ‘Be My Valentine’ treatment is the perfect way to unwind with your significant other. It includes: choice of a 30-minute body scrub, choice of a 60-minute massage, and exotic 30-minute coconut milk bath, with complimentary glass of bubbly for both guests. Hoi An’s historical charms are romantic and relaxation begins as you arrive at the airport, where Anantara will pick you up. Next, hideaway in comfortable luxury, waking up to leisurely breakfasts and picturesque river scenes. Indulge in an escape within an escape at our Hoi An spa, and celebrate evening romance with a tailor made Dining by Design experience, choosing from a collection of fine dining menus, or crafting the ideal culinary sequence with your personal chef. Then dine at a beautifully decorated table in a poolside pavilion, savouring an exquisite river outlook and the flawless service of your very own butler. Details: The Romantic Getaway Package starts from Dhs753 per room per night and the ‘Be My Valentine costs Dhs808. Get in touch: Call +84 510 3914 555 or e-mail hoian@anantara.com. Hop on a short-haul flight to one of the most romantic hotel’s in Manama, for heart-throbbing packages, decadent dining, spa treatments and more. On February 14, the hotel’s authentic Italian restaurant Vento is set to all love seekers with a four-course specialty menu prepared by Italian Chef Cristian Lisci. The menu begins with asparagus cream and crispy prawns, and continues with a line-up of romance-instilled dishes such as pink ravioli saffron with ricotta, pan seared hammour, or tenderloin scalloppini truffle cream and potato porcini soufflé. As a sweet ending, guests enjoy a delicious melting hot chocolate cake with pink peppercorn. Or, on the same night enjoy dinner at CUT by Wolfgang Puck, the Hotel’s American steak restaurant helmed by Executive Chef Brian Becher, will be sharing the love with an enchanting five-course dinner menu. CUT’s special dinner menu on Valentine’s Day will feature beluga caviar from the Caspian Sea, French black truffle gnocchi, pan roasted French loup de mare, a duo of USDA prime beef and a lavish dessert highlighting sweet fresh raspberries with white chocolate mousse. After dinner, The Spa at Four Seasons Hotel Bahrain Bay invites you to experience the Couple’s Retreat package, where you can indulge in a two-hour spa ritual complete with a relaxing full body massage, skin scrub and express facial using only 100 percent natural products. The journey continues as guests savor a romanceinfused three-course lunch, snacks or dinner including non-alcoholic beverages at Vento. Details: For more information call +973 1711 5000 or visit Four Seasons Bahrain.